Time and place make the story of Marie and Pierre Curie unique in the world of science and history. In 1891 she was a 24-year-old student, one of only 23 other determined young women studying at the Sorbonne among some 1800 men. In 1893, while looking for a lab where she could carry out some contract research on the magnetic properties of steel, she met Pierre. Eight years older, he was a full-fledged professor studying crystals and running the Municipal School of Industrial Physics and Chemistry. “We began a conversation and soon became friendly,” Marie wrote in her journal. That was the beginning. Redniss effectively blends biography, history, and art, as well as logic and emotion, in this amazing multilayered look at the Curies and the world their research has helped to create. The two were kindred souls utterly devoted to each other. Married, they worried about finding funding for their research, while Marie worked hard to balance children and a household with the demands of her beloved career. They shared a Nobel Prize in 1903 for the discovery of radioactivity. Unfortunately their discovery was already beginning to kill them. After Pierre’s death in a tragic road accident in 1906—his skull was crushed by the wheel of an overloaded wagon—Marie buried herself in her work and caring for her children, then surprised herself four years later by falling in love with another fellow scientist, Paul Langevin, a former student of Pierre’s. Paul was married, if unhappily, and his wife first blackmailed them, then spilled the beans to the press. Marie was pilloried as a “dirty foreigner,” a homewrecker and a Jew. The latter claims were inaccurate, but it didn’t matter. Paul fought a duel for her honor, but the publicity killed their relationship. Her public reputation in shambles, her health deteriorating from her work with radioactivity, Marie still managed to travel to Stockholm in 1911 to accept a second Nobel Prize—the first awarded to anyone, male or female—for the discovery of new elements radium and polonium. When World War I struck, she ignored her own growing maladies to develop mobile X-ray machines that could be driven to battlefield surgeries to help treat wounded soldiers. That work quickly rebuilt her reputation in the public eye and she was much in demand, but never enjoyed the limelight. Uncovering the secrets of radioactivity, and the need to apply it to bettering human life, drove her until her death in 1934. Redniss tells Pierre’s—but mostly Marie’s—story in parallel with sidelights on historical events and some issues raised by the Curies’ work; everything from Hiroshima and the side effects of underground testing to Three Mile Island and Chernobyl. What really makes this book stand out is its graphic and multilayered approach. In black and white, Pierre gets the left-hand pages, Marie the right, until they meet in black and white. There stands Pierre, multifaced as an image drawn by Picasso: one face cool, detached, thinking abstract thoughts, while the other looks across at Marie on the right. She looks over her shoulder at him. Neither is smiling, but their eyes reveal everything. Then come the colors, evocative and vibrant, telling a story behind the words. Research is described on pages shaded with cool blues and greens. Strong emotions get strong color backgrounds. In a resonant touch, Redniss colored the pages using cyanotype, where paper is coated with light-sensitive chemicals that reveal deeply saturated colors when exposed to ultraviolet light. Likewise, the cover of the book is supposed to be printed with luminescent ink that glows in the dark, like holding a radium-painted sketch in your hands. What better way to recreate Marie’s enchantment her groundbreaking work? 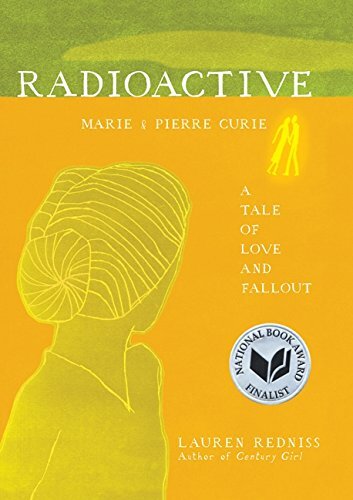 With haunting images and text, Redniss retells the story of Marie and Pierre Curie, and the “fallout” of their lives and discoveries, layering it with provocative historical context that illuminates some cosmic ideas as well as the very human people behind them.